Especially in fine weather the Scooter is the ideal city vehicle, it is very easy to drive even for beginners, it is extremely manoeuvrable and fits into the smallest parking space. Driving a scooter is very individual, it also guides you along paths that are forbidden for cars and larger vehicles. However, there are some things to consider when renting a scooter. The following article introduces you to all the details that are relevant when renting a scooter, but first of all some ideas on how to ride a scooter. On our online price comparison portal for rental cars and scooters, you can choose between different models with different performance, appearance and equipment. By specifying cubic capacity (ccm), driving licence class and the appropriate insurance in the search mask, you will find within a very short time individually tailored scooter offers, which are really cheap to rent. Specify a desired region in order to be able to see all available offers of the scooter rental companies on site in a transparent way. If you decide to rent a scooter in price comparison, you book really cheap and save up to 60 percent. Before renting you should check which scooter you are allowed to drive with your driver's license and what the insurance cover looks like. For a scooter up to a maximum of 125 ccm you need at least an A1 class driving licence in addition to the appropriate insurance. If you choose a scooter with a capacity of more than 125 cc and a maximum of 35 kW, you will need a class A2 driver's license, the same conditions apply to insurance cover as apply to less powerful scooters, and insurance must be taken out in any case. For scooters with a displacement of more than 125 cc and more than 35 kW an A-driving licence is a prerequisite, insurance cover and necessary insurance do not differ from the other classes. Rental and driving an e-scooter requires a class A or B driving licence, insurance cover or a performance-related insurance is required. When renting a scooter, you must always pay a deposit, the amount depends on the class and performance of the selected bike. The deposit can be blocked by credit card and paid in cash at some providers and will be returned at the end of the rental period. You can find out which insurance cover is required for a particular scooter when you rent it when you book it on our portal. In addition, you will find the tank regulations of each car rental company as well as information about available additional services. In addition to the criteria of insurance and driving licence, all scooters are subject to the obligation to wear helmets. Either you already have your own helmet or just rent it with the scooter. In many Mediterranean holiday countries, when renting a scooter a driving licence is also required, but it is sufficient to have a normal driving licence for a 125 cc scooter if you have some driving experience. In Spain, the driving licence must have been issued at least three years before renting a scooter in order to comply with national regulations. Especially during your holiday in Mallorca you can take a scooter to explore the island on your own. In all EU countries, the European driving licence on the back of the licence applies to all vehicle categories. However, in some countries the rules are interpreted more generously than in our country. In principle, they must be at least 18 years old for renting, but some scooters are only within reach from a minimum age of 21 years. In terms of insurance coverage in France, Italy or Spain do not differ significantly from each other. A scooter insurance corresponding to the performance class is obligatory in all countries. In addition, when renting a scooter in all countries a deposit must be deposited and helmet requirements apply everywhere. First of all, a powerful scooter is also considerably cheaper than a medium-sized car in terms of fuel consumption. In addition, the maneuverable vehicles allowed driving on narrow paths and bring a lot of fun in connection with independence. When you ride your scooter, you have a completely different view of things that are often hidden behind a car windshield. In addition, you can stop anywhere with a rental scooter without having to search for a parking space. Particularly in the countries of southern Europe, the scooter has long been part of the street scene and is driven by people of all ages. 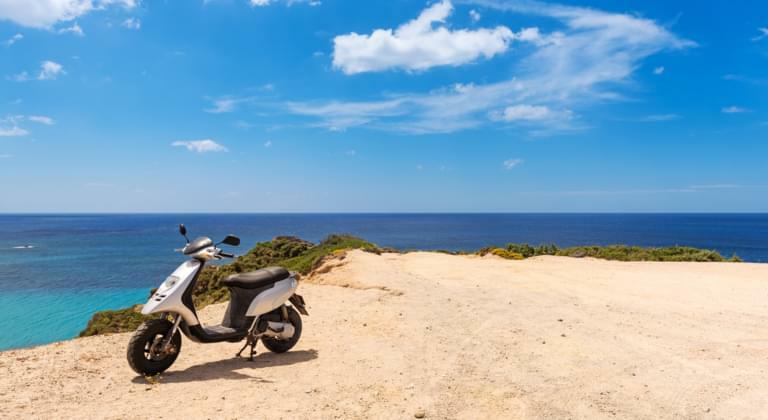 For young travelers and older holidaymakers, the decision to choose a scooter means noticeable relief for the travel budget, and pleasant holiday experiences are also an option.